more drawing and talk of wells. How are you , are you well? The Hebrew writing in the drawing is from Genesis 29:6, where Jacob meets Rachel. First Jacob inquires about his relatives and how the family is. And in the very same line, we meet Rachel. I put twelve sheep in the drawing, and do you know why? Because there at the well was a meeting between Rachel and Jacob. PS note: speaking of Shalom, if you haven`t yet entered the first Challah and Cherry Blossoms giveaway, please read the end of the post below and enter! Up until Dec. 3, and be eligible to win a book, Shalom in the Psalms! PSS did you notice Rachel`s dress? I gave her a dress that is yellow with a pattern of pink cherry blossoms! PSS I hope that even those who don`t read Hebrew, that you are starting to recognize the word `Shalom` even in the Hebrew letters!!! Wishing you well! The drawing of the meeting between Rachel and Jacob at the well is superb! 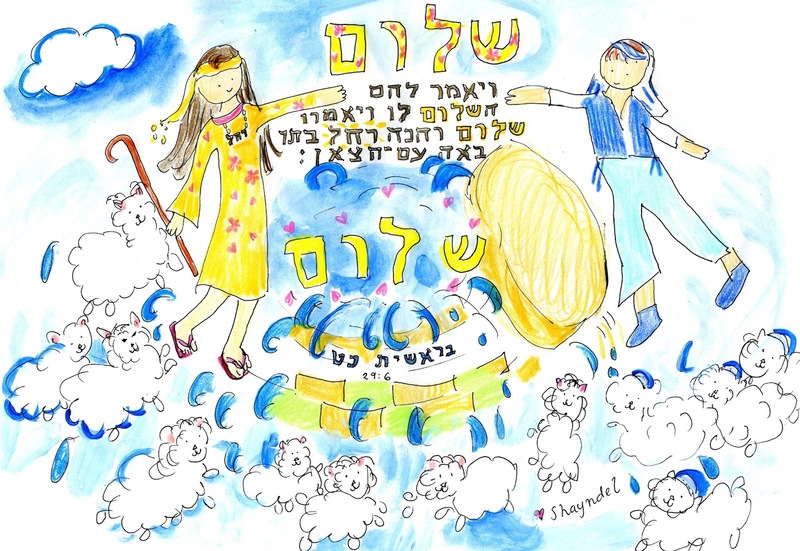 All the elements appear to be in perfect harmony: the sheep, the cherry blossoms on the dress, the word Shalom in hebrew, the blue color of the water. You should publish a book with your bible drawings. Thanks, wow Duta, I would love to do that! Please pray with me towards that! I actually have been thinking about it, and my vision also is to include Japanese (bi-lingual) to introduce the stories here, as well as share a personal vision of the Japanese elements like cherry blossoms and Mt. Fuji appearing with the Hebrew themes, as I first started studying the Torah here in Japan!! God Bless you. Thank you always for your encouragements!